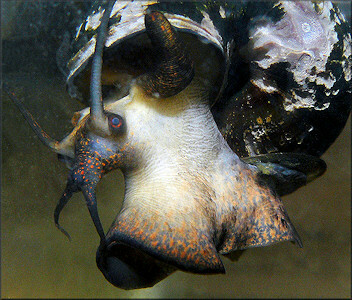 During a trip to the U. S. post office (Pottsburg Branch, 11700 Beach Boulevard) on 17 December, 2006, this investigator noticed what appeared to be apple snails egg clutches on a culvert spanning a nearby drainage ditch which ran south between the post office and the adjacent Sam's Club. As time was short, further investigation was postponed to the next day. Upon my return the next afternoon, it was confirmed that Pomacea paludosa (Say, 1829) Florida Applesnail egg clutches were present as well as those of another unidentified apple snail species. None of the egg clutches appeared to be fresh; therefore it appears likely they were deposited during the spring egg laying period. 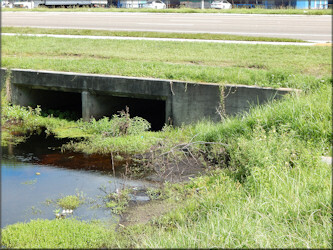 A thorough search of the full length of the ditch south of Beach Boulevard failed to reveal any live apple snails of any ilk. However, four empty Pomacea diffusa shells and one P. paludosa shell were found near where the ditch intersects Beach Boulevard. Investigation revealed that the proper name for the drainage system was Mill Dam Branch. 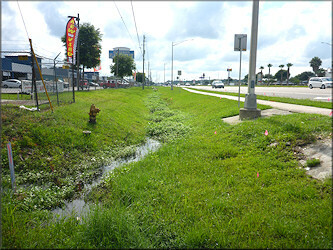 During a return visit on December 19th, the upstream portion of the ditch north of Beach Boulevard was thoroughly investigated. 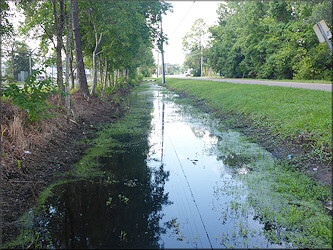 The ditch continues north from Beach Boulevard adjacent to Lantana Lakes Drive (Lantana Lakes Subdivision) for about 175 yards before crossing west under the road and continuing a like distance before intersecting a small dam which impounds the subdivisions series of medium sized lakes. Empty Pomacea diffusa shells were found throughout most of this approximately 350 yard distance. However, they were especially common just below the spillway of the small dam where two recently deceased specimens with partial remains of the animals present were found. A much more modest number of P. paludosa shells were also found and no egg clutches produced by either species were seen. The three largest of the Lantana Lakes Subdivision lakes were then investigated and no living or dead specimens of either Pomacea species were seen although a few P. paludosa egg clutches were found on a culvert at the south end of the northernmost lake. On December 21st the downstream portion of the ditch below the Sam's Club was reconnoitered with the first easy access being a somewhat rickety wooden bridge over the waterway on Donnawood Drive inside the large Countryside Village Trailer Park. The remnants of three Pomacea diffusa egg clutches were subsequently found on one of the bridge pilings. A search of the ditch in this area, as well as downstream for a considerable distance, failed to yield any Pomacea diffusa shells or egg clutches although a single empty Pomacea paludosa shell was found. Several additional visits to the habitat were subsequently made, and finally on 12/30/2006, a live juvenile P. diffusa was found inside a concrete culvert on Lantana Lakes Drive. The same date, a fresh dead adult specimen with the operculum and an animal intact was also found in the same general area. 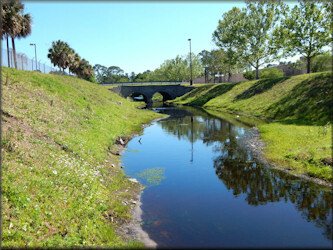 Having confirmed that live specimens were in fact present, on 1 January, 2007 a much smaller upstream portion of the drainage system east and immediately adjacent to Beach Boulevard (about 125 yards in length) was investigated. 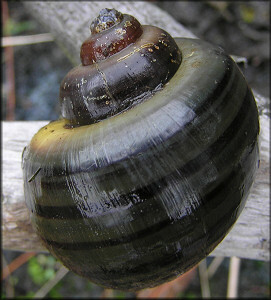 A single live adult Pomacea diffusa was found as well as the shells of other deceased specimens. On 1/10/2007, this reporter, along with Dr. Patrick Baker (University of Florida/IFAS), made a further investigation of the ditch during which time two additional live tiny juvenile specimens and one live adult specimen were found. Over the next ten years all the aspects of the drainage system were thoroughly explored and the Pomacea population was monitored on a periodic basis. No significant further dispersal of the snails was found and the population remained relatively stable despite periodic dredging of the habitat by government authorities. 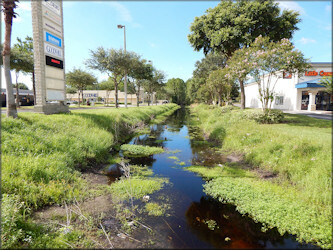 Ultimately on 7/17/2017, over a decade after finding the Pomacea diffusa colony near the U. S. post office, an apparent second population was discovered in a small drainage system originating adjacent to the Beach Boulevard Flea Market - a location slightly north and east of the population discovered in 2006. 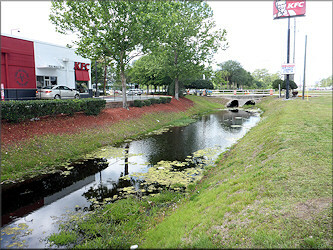 This population had also colonized a considerable distance of the shallow ditch system which parallels the north side of Beach Boulevard as well as a much larger downstream portion on the south side of Beach Boulevard. There is no apparent water connection between the post office and the flea market populations. Since Pomacea diffusa is an especially popular aquarium trade species available in a wide variety of colors including so called gold, ivory, and blue, it's quite likely that their presence in Duval County is a result resident discarding (dumping) unwanted specimens. Pomacea diffusa has been a popular aquarium species in Florida for over half a century and has been found in the wild here since at least 1965 (see: Clench, W. J., 1965 Pomacea bridgesii (Reeve) in Florida. The Nautilus 79(3): 105. Jan.). Available information (1/07) indicates that the species has been found in the wild in Miami-Dade, Palm Beach, Broward, Alachua and Hillsborough Counties in addition to Duval County. Note: Pomacea diffusa was originally described by Blume in 1957 as a subspecies of Pomacea bridgesii based on specimens collected in Santa Cruz, Bolivia. Pain  argued that P. bridgesii bridgesii was a larger form with a restricted range, with the smaller P. bridgesii diffusa being the common form throughout the Amazon Basin (Brazil, Peru, Bolivia). Cowie and Thiengo  suggested that the latter might deserve full species status, and subsequently the two taxa have been confirmed as distinct species by genetic analyses [K.A. Hayes, R.C. Joshi, S.C. Thiengo and R.H. Cowie, in prep. ].